The History Press has a great post, including an excerpt from the chapter on “Marshal Douglass,” up on their blog. READ HERE! Were Frederick Douglass alive today he would not sit back quietly and hold his tongue. President Obama’s signing into law House Resolution 6336, giving the Joint Committee on the Library two years to move the bronze statue of Douglass now in the lobby of One Judiciary Square to the United States Capitol’s Emancipation Hall, would not impress the Lion of Anacostia. During his remarkable life Douglass championed many public and private causes—the abolition of slavery, women’s rights, temperance, classical and technical education for freedmen and their sons and daughters, and Irish Independence, to name a few—but his most enduring advocacy on behalf of D.C. and Washingtonians is all but forgotten. In the recent burst of press releases and stories about the statue’s move, Douglass’ national legacy has been invoked, but not his local one. 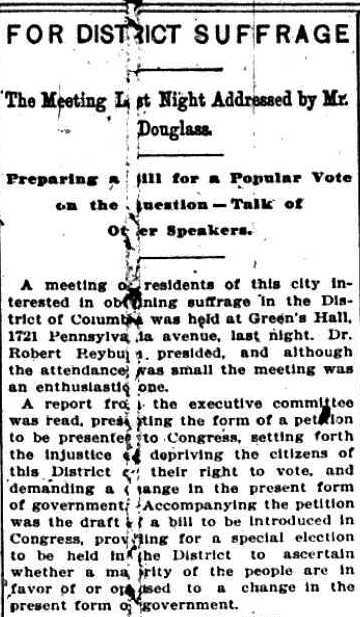 Nowhere will you find mention of Douglass’ activism with the Citizens’ District Suffrage Petition Association, a late 19th-century organization whose work remains unfulfilled. Read the full post on DCist.com HERE. Step into the mind of Frederick Douglass with Professor Nicholas Buccola [The Political Though of Frederick Douglass: In Pursuit of American Liberty] and go on a search for American Liberty. To achieve liberty how do we balance the need for individual freedom with civic responsibility? In this conversation Buccola will talk about how escaped slave Frederick Douglass, who helped build the first American Civil Rights Movement, had a special view on both personal liberty and the role of society. 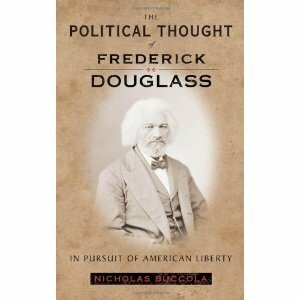 He argues that Douglass’s view can help us better understand our own liberty today. Free, no tickets required. The first issue of the Bee was printed on June 3, 1882. William C. Chase, a lawyer, local politician, businessman, and native Washingtonian took over as the paper’s principal editor by the end of the first year of publication, and his superb editorial skills eventually turned the Bee into one of the most influential African American newspapers in the country. The Bee represented the Republican attitudes of its editor, although Chase did not hesitate to criticize Republican Party leaders when he thought they were on the wrong side of an issue. The initial motto of the paper was “Sting for Our Enemies—Honey for Our Friends.” Civil rights for America’s blacks was a primary concern. Although figures are not available for each year of publication, circulation of the Bee varied from a low of 1,250 in 1892 to a high of 9,700 in 1922. 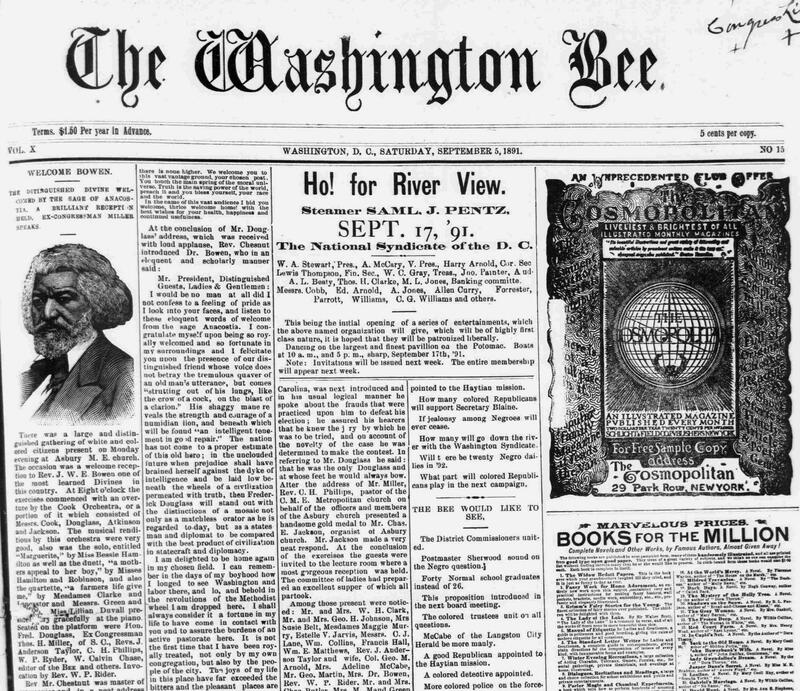 The Washington Bee focused much of its attention on the activities of the city’s African Americans, and its society page paid special attention to events at local black churches. The paper also covered national issues; by the turn of the 20th century it was publishing articles about events across the country by its own correspondents as well as from wire services. Like most publications of the day, there was also an extensive array of advertising, much from white-owned businesses. The remaining space included the typical filler content purchased from various sources. 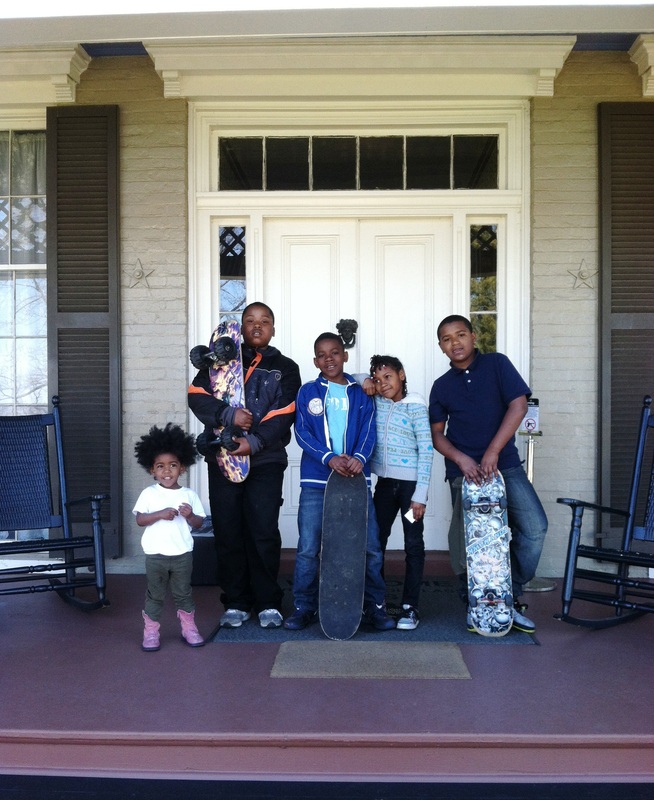 Through his editorials, Chase conveyed his passionate views on a variety of issues. The Bee’s editorials were noted for their criticism of Booker T. Washington and his apparently conservative positions on black racial progress. The attacks on Washington intensified in 1904 when the noted black educator provided financial assistance to the rival Colored American . The criticisms ended abruptly, however, when Chase’s paper began experiencing its own financial difficulties, and Washington, apparently, contributed financial support to the Bee . Chase remained as editor until his death in 1921. Unfortunately, the paper’s financial troubles continued unabated. The Washington Bee , whose presses had operated at 1109 I Street in the city’s northwest quadrant, folded the year after its long-time editor died. The DC Commission on the Arts and Humanities is pleased to announce that plans are underway to place the statue of famed Abolitionist and Writer Frederick Douglass’ Statue in the United States Capitol’s Visitor Center’s Statuary Hall, thanks to the signing of a Bill (H.R. 4021) by President Barack Obama on September 20, 2012. The Douglass statue has been temporarily housed at DC’s Judiciary Square Building (441 4th Street, NW) since 2007 and was originally commissioned by DC Arts Commission in 2006 through the DC Creates! Public Arts Program. DC Creates! Public Art Program purchases, commissions, and installs artwork for public sites throughout the District of Columbia. The program was established by 1986 legislation that allocates up to one percent of the District’s adjusted Capital Budget for the commission and acquisition of artwork. The Douglass statue was selected as the result of a popular vote by DC residents. The statue was created by sculptor Steven Weitzman who portrayed Douglass in bronze as an orator and writer of the North Star publication. The North Star, considered the most influential black antislavery newspaper, founded by Douglass in 1847 and published until 1851. 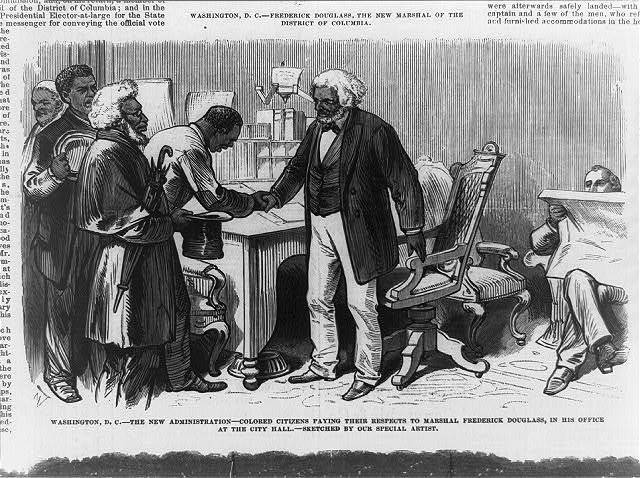 Born a slave in Maryland, Douglass made Washington D.C.’s Anacostia neighborhood his home in 1877 until his death in 1895. The DC Commission on the Arts and Humanities provides grant funds, programs and educational activities that encourage diverse artistic expressions and learning opportunities, so that all District of Columbia residents and visitors can experience the rich culture of our city. More information on the DC Commission on Arts & Humanities here.